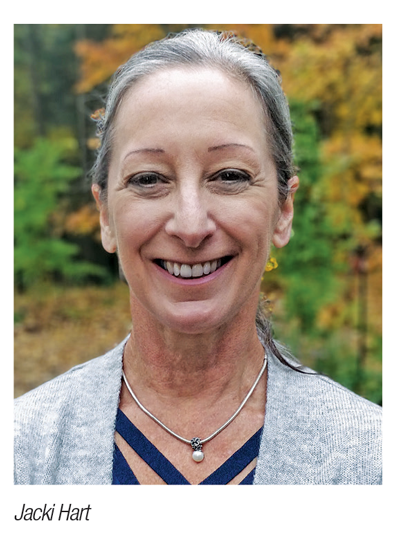 Jacki Hart ran a successful landscaping company in Ontario’s Cottage Country, and went on to administer Landscape Ontario’s Peer to Peer Network. She also coaches landscaping pros and clients from other sectors through Consulting By Hart. Have you ever asked a competitor for business advice? Absolutely. And competitors asked questions of me, as well. Do I have a written contract? Where does one get staff? What are the logistics of delivering materials on barges? Now, as a coach and through the Peer Network, I see even more questions, focused on the high value of advice from peers. You work with both new entrepreneurs and veterans. Is it ever hard for the young guys to hear and understand what experienced folks are saying? Many landscape companies struggle with growth. In your experience, is there a dollar revenue point, or number of employees, where it’s hard to break over? I see a breaking point at revenues of around $1 million. That is a milestone, and if you don’t have systems, things will unravel. I worked with a building contractor who could not pull past the $2 million mark. I worked with them for two years, implementing systems. Now their revenues are at $8.9 million, net profits are up 10 per cent, and they have booked sales of $12 million. It’s all about eliminating bottlenecks. For example, if you grow to more than 10 employees without upgrading systems, things will crack. The next milestone is 20 employees, and you must scale systems yet again to break 50. Have you ever seen mentorship go places it should not go, such as price fixing? Yes, I have seen some peer price fixing — and gouging. While collusion is illegal, setting a standard rate, and helping others know when they are leaving money on the table, isn’t. There’s a fine line between price fixing, and mentoring peers to bring their rates up to current market trends. Intent is a big part of which side of the line each situation falls, I think. Yes! Hank Gelderman, Gerald Boot, Bob Tubby, Terry Murphy, Jean Paul Lamarche. All of them have been great help to me over the years when I needed it. Paying it forward I have mentored hundreds outside of Prosperity Partners or Consulting By Hart, in the landscape industry, the building industry and in general business. Have any of the business owners you mentored gone on to help others? Yes, many have. Brian Cotter, Lindsay Drake Nightingale, Christine Moffit, Susan Potvin, John Larsen, Chris Ray... Often they mentor each other, according to their unique strengths, such as expertise in workers’ comp insurance. Some of them even have their own sub-group; they meet for dinner and even share employees. I like to think about mentorship as a catalyst for trust. Connect with Jacki Hart at her full-day workshop on Jan. 7, during Congress 2019. Visit www.LOcongress.com for more information.